Best-in-class load capacity and a US made dual-handle, shift-on-the-fly, two-speed winch, that can raise your load twice as fast as competitive models, lets you complete your jobs faster than ever before. 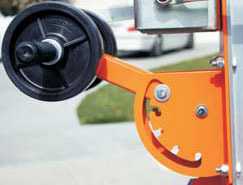 Robust, construction-grade cast metal cable pulleys, heavier-gage aluminum extrusions, and US made Colson® Performa non-marking casters provide far-superior durability and extended service life. 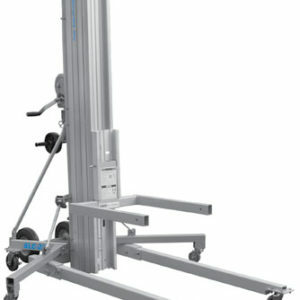 Forks can be installed below the carriage or in the inverted position for full free lift and maximum height. 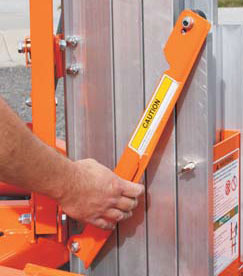 Rolls easily through single door width and convenient dual-height handles at top of mast assist in moving the machine in the tilt-back position. 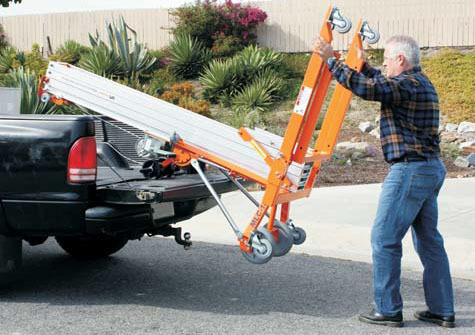 Featuring truck bed loading wheels that can be quickly adjusted to various tailgate heights providing easy loading and transport to and from the job site. Tool-less folding legs with integrated, non-marking stowage wheels allows easy, floor-friendly maneuvering in stowed position.